The current monetary system in Cuba has peculiarities that distinguish it from the systems in other countries, where dollarization has been largely a result of high inflation. Powerful political reasons have influenced the course of dollarization in the Cuban economy, and it is notably in the interest of the Cuban government to keep the dual system, despite the familiar rhetoric of independence. In this paper, we consider the structure of Cuban monetary dualism, analyze its evolution and determine its influence on the future transition to a market economy. The persistence of socialism, however, should not obscure the fact that relevant changes have already occurred in Cuba, and have laid the groundwork for a less painful transition than that experienced by Eastern Europe. Failure to appreciate these changes, perhaps stemming from a dogmatic view of Cuban socialism, could lead to mistaken policies during an eventual transition. As the reader will confirm, the principal justification for study of dollarization in Cuba is precisely the need to extract relevant lessons for the process of transition. The establishment of the dollar in Cuban society will necessarily influence the future exchange rate regime, and in this sense we believe that a system of fixed exchange rate is the best option. Analyzing the Cuban monetary system requires a review of the theory on dollarization and currency substitution, 1 and the recent works on dollarization in the Eastern European transition. Most of the relevant literature has been stimulated by experiences in Latin America, while the experiences of Eastern Europe, the former soviet republics and Mongolia have also contributed to enrich the theory. Nevertheless, the Cuban case is sufficiently particular that it merits close attention to its specific characteristics, which we do in this paper. In writing this paper we have faced the challenge of a lack of reliable statistical information. Beyond the problems inherent in any statistical source, there is the fact that the Cuban government keeps tight control on economic information. Furthermore, there are no official statistics of any sort on important variables such as inflation and exchange rates in black markets.2 Recent works of some Cuban economists living abroad and foreigners have partially corrected this problem. The paper is structured as follows: in section one, we briefly review the main theoretical literature on dollarization and currency substitution; section 2 is devoted to the evolution of dollarization in Cuba; section 3 discusses the best options for Cuba in the field of monetary policy during transition; and section 4 presents some conclusions. LITERATURE AND EMPIRICAL EVIDENCE ON DOLLARIZATION. In the 1970s, the first theoretical models appeared which incorporated currency substitution and dollarization as an important explanatory factor of the real effects of changes in nominal domestic monetary stocks. Other contributions attempted to quantify such effects and explain the causes of such dollarization. A pioneer model appears in Calvo and Rodríguez (1977). This model explains how, in the presence of currency substitution, an increase in the rate of growth of domestic currency can sharply erode the real value of that currency. A key aspect of this model is the lack of existence of a pure asset, so the ratio of demand of domestic currency to foreign currency is negatively correlated to the expected rate of nominal devaluation.3 When the agents know there will be an increase in the rate of growth of money, the real exchange jumps immediately, overshooting its longrun target. Thomas (1985) enriches the Calvo and Rodríguez model by including assets denominated in domestic and foreign currency. Currency substitution is a function of the opportunity costs stemming from holding each currency (nominal interest rates on both bonds). Therefore, a decrease in the nominal interest rate of the domestic bond (without changes in foreign interest rate) could discourage currency substitution, meaning the use of foreign currency as a medium of exchange. However, currency substitution could decrease, but dollarization could remain unchanged, because the latter is a function of the difference between the real yields in each currency. If there is no change in this difference, neither will there be any change in agent’s portfolios. Also from the 1980s date some empirical studies devoted to the analysis of dollarization in Latin America. We can mention the works of Ortiz (1983) for Mexico, Fasanho-Filho (1984) for Argentina, and Ramírez-Rojas (1985) for Argentina, Mexico and Uruguay. The empirical results in all of them support the hypothesis that the expected rate of depreciation is a significant variable explaining dollarization. When foreign exchange risks increase, agents protect themselves by shifting to foreign currency. Sahay and Vegh (1995) examine dollarization in transition economies of Eastern Europe, former Soviet republics and Mongolia. The authors classified the countries according to their inflation and fiscal deficit levels, as well as the previous level of market development. Some important conclusions emerge from this study. First, they point out that elimination of legal barriers to the use of foreign currency could stimulate dollarization. In addition, they verify that the pervasiveness and sharpening of dollarization are positively correlated to inflation. Given the shortage (or outright lack) in these economies of financial instruments, which incorporate inflation and guarantee a determined real yield, agents shift to foreign currency looking for a shield against inflation. This behavior is consistent with that predicted by Thomas (1985). Should dollarization be repressed? The answer to this question is often negative. Although there is a consensus that dollarization undermines the active role of monetary policy in the economy, it is also recognized that dollarization is basically an effect, and not a cause, of strong inflationary processes, so it is inefficient to attack the effects without eliminating the roots. Taking this into account, a second question arises: What is the ideal exchange rate regime in countries with high levels of dollarization? It is recognized that in the countries with high levels of dollarization and flexible exchange rates, the economy may lose its nominal anchor, because monetary authorities can not control the money supply in terms of domestic currency. For this reason, using a fixed exchange rate seems to be the best option for highly dollarized economies, especially those, which are small and extremely open. With respect to Cuba, many important problems like dollarization and inflation in the black market attracted little attention in academic circles until the middle of present decade. 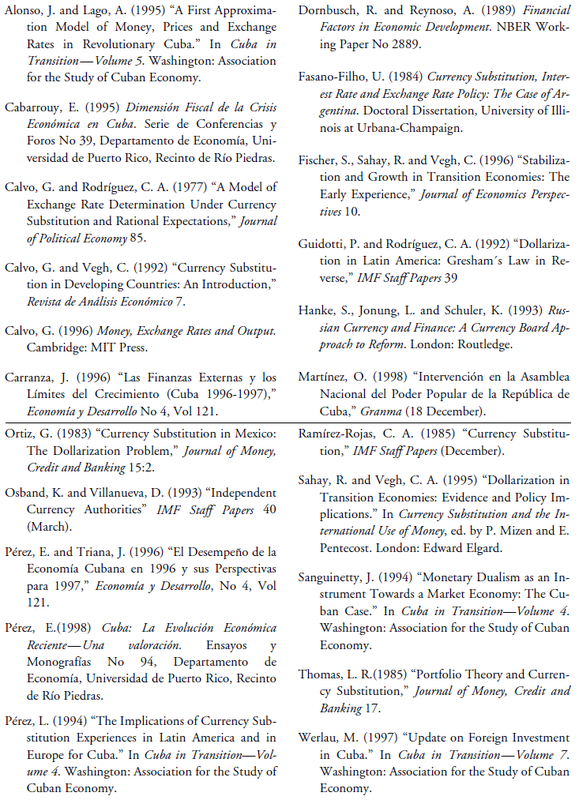 Sanguinetty (1994) and Pérez (1994) analyze the advantages and disadvantages of monetary dualism for Cuba, in the present as well as during transition, while Alonso and Lago (1995) developed the first econometric model for Cuba which related output, inflation and exchange rates. As the latter authors recognize, this model also faces the lack of reliable statistical series. From our point of view, power purchasing parity (as assumed by Alonso and Lago) provides a convenient theoretical assumption to analyze the evolution of the nominal exchange rate in the Cuban black market, through the middle of the 1990s. The severe economic crisis affecting the country in the early 1990s generated a plunge in consumption and made saving very difficult. The uninterrupted inflation of black market dollar prices reflected the increased scarcity of domestic goods4 resulting from a dramatic supply shock. Because, until 1994, monetary authorities did not take any measure to eliminate the excess of liquidity, it provoked an increase in prices and a nominal appreciation of dollar in the black market. The rational expectations approach (also used by Alonso and Lago) is very useful to explain the sharp nominal appreciation of the Cuban peso in the middle of 1994, when the government announced some stabilization measures to reduce the excess demand in the economy. Nowadays, due to the extinction of Soviet Bloc, the nominal exchange rate reflects simply the equilibrium between demand and supply of dollars. Dollarization in revolutionary Cuba has its roots in the first years of the new government headed by Fidel Castro. Among the government’s first acts was to establish a monopoly over foreign trade and the exchange rate. Cuban citizens were forbidden to own or trade foreign currencies, gold or foreign assets. These measures, together with other restrictions imposed by the Cuban government, fueled the creation of a black market in which dollars and Cuban pesos were exchanged, as well as basic goods. The peso/dollar black market exchange rate deteriorated progressively, from 1.67 in 1959 to 6.25 in 1961 (Alonso and Lago, 1995), at which time the gold reserves of the Cuban National Bank were exhausted. The Cuban government responded by nationalizing the banking system (without indemnification) and the peso ceased to be freely convertible. From that moment until 1993, when private ownership of foreign currencies was again legalized, the black market remained the only means for the common citizen to obtain dollars. It bears emphasis that the rate of exchange in that market has not always reflected the true scarcity of currency in Cuba. The strict laws and penalties imposed by the government, and the high enforcement capacity of the state apparatus have implied enormous transactions costs in the black market for dollars over the years. On the demand side, few citizens were willing to run the risks of contacting a currency trafficker, while on the supply side, foreign tourists where only permitted to exchange pesos for dollars at the official rate of one peso for one dollar. In the decade of the 1980s, various developments significantly affected monetary dualism in Cuba. Despite the timid attempts to reform the rigid socialist planning system during the 1970s, the Cuban economy had become extremely inefficient. The dependence on the Soviet Union and the debt to that country grew very rapidly. At the same time, the debt to capitalist countries in Western currencies also showed a clear upward tendency. In 1982, unable to meet its foreign currency obligations, the Cuban government declared a moratorium on payments of debt (Carranza, 1996). The situation was exacerbated by the growing cracks in the Cuba-Soviet Union alliance, which made the possibility of additional Soviet assistance more remote. The shortage of currency and the uncertainty regarding Soviet intentions pushed the Cubans to seek new sources of hard currency. It was at this time that the Cuban leadership decided to revive tourism—a sector that once constituted one of the greatest of the country’s comparative advantages, but had been neglected for years. According to the philosophy of the Cuban revolution, tourism was considered a vestige of capitalism and a symbol of Cuban dependence on the United States. Viewed through a more pragmatic lens, the Cuban government was not interested in basing the development of the country on an economic activity which implied a high political cost, since the affluence of foreign tourists and their contact with the Cuban population posed a serious challenge to ideological indoctrination, particularly of the country’s youth. Thus the resurgent interest in promoting tourism in the 1980s must be viewed as a retreat for the Cuban leadership. Logically, the Cuban government had to avoid at all costs that the economic benefits derived from tourism would undermine the political hegemony of the Communist Party. Therefore, it tried to create conditions which would isolate tourists from the population. The tourism infrastructure developed along these lines, with a system of hotels, restaurants, and stores in which the only allowable means of payment was the dollar, and to which regular Cuban citizens were forbidden access. We refer to this as the state commercial dollarized network. Nevertheless, as it should have been expected, not even the most sophisticated methods of vigilance and control could guarantee the total separation between foreigners and Cubans. Unfortunately, prostitution was the factor that opened the doors for tourists to the true Cuba, and at the same time it was the economic activity that began to tie the Cuban population to the world of the dollar. During the 1980s, despite the steady decline in the economic situation, the greatest part of the Cuban population continued working in the state sector, receiving payment in Cuban currency. But the situation changed drastically by the end of the decade and the fall of the Berlin Wall. The disappearance of the Socialist Bloc meant for Cuba the loss of an important source of material and financial resources. The threat of total paralysis hung over the Cuban economy. Although there was no massive dismissal of workers, and salaries continued to be paid, the terrible supply shock together with price controls established in the first years of the revolution provoked a powerful inflationary spiral in the black market. The loss of purchasing power pushed many people to complement their official economic activities with informal activities, which implied incorporating themselves either directly or indirectly into the tourism sector. In this period, the Cuban peso served alongside the dollar both as a store of value and a medium of exchange. In the black market it was possible to acquire with Cuban pesos items originating from the state commercial dollarized network, at prices reflecting the black market exchange rate. People tied directly to tourists, whether illegally or legally, received incomes directly in dollars or in goods from the state commercial dollarized network. 1992 was an extremely painful year for the Cuban population. The Cuban economy remained in a sort of limbo, since the republics of the old Soviet Union refused to trade under the traditional terms of exchange and the ties with Western countries were still very weak. 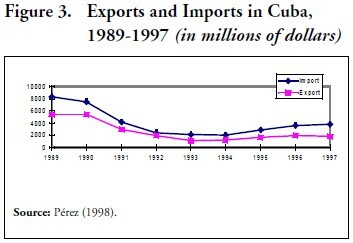 The sudden fall in the Soviet subsidies of primary materials and food not only affected the productive plant in Cuba, but also the non-dollarized black market. Until 1992, many products were smuggled out of state-run enterprises and traded in the black market, but given the sharp fall of national production and international subsidies, products from the state commercial dollarized network suddenly became the only alternative for public consumption. Already by this point, the rationing system had stopped supplying the most essential consumption goods. The collapse of national production also brought about a sharp increase in the demand for dollars, which were of course necessary to access the state commercial dollarized network. In 1993, given the impossibility of controlling the illegal holding of assets, the Cuban government took the wise step of decriminalizing it. Among other things, this measure avoided placing officials in the ridiculous position of prohibiting something that had become a part of everyday life. From the economic point of view, the legalization of the dollar contributed to a fall in transaction costs derived from legal impediments to directly accessing the dollarized stores. Also in 1993, a new agricultural policy took effect, with the objective of raising the efficiency of the sector and alleviating the severe shortage of food that was affecting the population. With this end, a process of transforming state agriculture enterprises into cooperatives began. The workers on state farms would remain in the cooperatives with free use of the land indefinitely. The previous measures—which can be considered supply policies—proved incapable of stopping the economic decline. In 1994, the economic situation continued to deteriorate, and the dollar continued gaining ground against the peso. Between 1992 and 1994, the depreciation of the peso accelerated markedly, with the exchange rate reaching 120 pesos per dollar by the latter year.5 In this manner, the Cuban peso was gradually replaced by the dollar for both the monetary functions of means of exchange and store of value. The distinction between the two functions became scarcely perceptible, since dollars were not demanded with the intention of “saving” in the strict sense of the word, but with the intention of storing purchasing power for next week’s groceries. The uncontrolled climb of prices in the black market, together with the reigning shortages in the smaller rationing network, caused a considerable fall in the real incomes of the population. The fall in real salaries was so great, that for many people the incentive to work at all simply evaporated. This was an important cause for alarm among the authorities, since worker absenteeism affected directly and indirectly the functioning of the state dollarized economy, and undermined political control of the government. In the midst of this difficult situation, the economic authorities decided to implement a new series of reforms. The new economic program essentially attempted to eliminate excess liquidity in the hands of the population, and as a consequence, the continued depreciation of the Cuban peso. 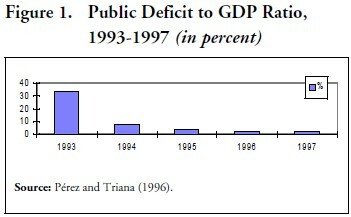 Among the specific reform measures: reduction in the public deficit (Pérez and Triana, 1996); new taxes, and increases in old ones; and the opening of free markets for agricultural goods (Figure 1). The effects were strong and immediate: inflation fell considerably, and the exchange rate appreciated. Without any doubt, these reforms prevented the total collapse of the economy and of the regime. Since 1994, the Cuban economy has enjoyed relative stability, with a steady exchange rate of approximately 20 pesos/dollar (Martínez, 1998), an end to the inflationary spiral and falling GDP, and even a modest increment in production (Pérez, 1998). Nevertheless, this apparent stability does not hide the fact that the reform process in Cuba is travelling a rough road. The economic reforms have reordered society, exalting some who would have been considered scourges not many years earlier. At the same time, the rupture between political loyalty and economic well being has awaken strong jealousies in sectors and social groups that traditionally had supported the government. Logically, the government cannot ignore this situation and the highest authorities have taken measures, which undeniably signal a brake — or even a reversal — of the reform process. Even when the Cuban peso had shown a clear tendency towards appreciation, the process of dollarization showed no signs of decline and even the transactions in Cuban pesos rely on the dollar as a unit of account. This phenomenon has also occurred in other economies which have reached a high degree of dollarization, but in the Cuban case the persistence of dollarization is not due only to adjustment costs, or “learning by doing” (Dornbusch and Reynoso, 1989). What is most curious, the highest Cuban authorities have shown a reluctance to reinstate the Cuban peso to the rightful monetary status of any national currency. This decision by the authorities is due primarily to the monopolistic nature of the Cuban State. From the purely economic point of view, the foremost objective of the government is to maximize its revenue in dollars. Thus, the optimal arrangement would be for an elite policymaker to receive revenue in dollars and pay ridiculously low salaries in pesos. This is the reason why the government, while it continues to encourage use of the dollar, does not completely do away with the Cuban peso. What’s more, since the interest rate is a variable with no relevance whatsoever in the Cuban economy, it makes no sense to manipulate it through the issue of more money.6 Why, then, run the risks that having a single domestic currency would necessarily involve? What sense would it make for the Cuban administration to run the risk that, by some error of the Central Bank, reserves of foreign currencies might run out? In summary, the Cuban leadership is not willing to abandon the direct collection of income in dollars or to confront the exchange rate risks that would be involved in a new exchange rate regime. 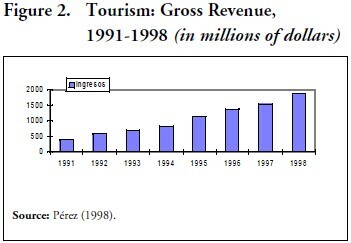 On the other hand, despite the gains achieved in the tourism sector, it has become impossible to reverse the decline in other important sectors, such as sugar production (Pérez, 1998). No less alarming is the persistence of strong distortions in the allocation of resources, many of them sharpened by the dual monetary regime, although they have their origins in old restrictions and governmental regulations. Due to the fact that most professionals, doctors and technicians, are forced to work only in certain places, with ridiculously low salaries in Cuban pesos and without permission to work on their own account, many of these professionals have chosen to resign from their profession to work as waiters in tourist facilities or as private taxi drivers. The lack of economic incentives for professionals is one of the principal causes of the emigration toward developed countries — a process that the government has not been able to stop through the normal coercive methods. Presently, at a macroeconomic level, the Cuban economy is in a very slippery equilibrium, due to the subordination of economic policy to the interests of the governing party. This equilibrium could be shattered at any moment. Dollarization of the Cuban economy has ceased being a transitory phenomenon, to become an essential part of that economy. The present Cuban government has shown repeated preference for the use of the dollar, for which reason, short of a transcendental change in Cuban society, no significant change in the current monetary regime should be expected. For years, an ongoing debate has considered the feasibility of maintaining a dual monetary system during the process of transformation from a statist economy to a market economy. There are two essential positions in this debate: those who advocate the elimination of the dual system, and those who believe that monetary dualism could be an efficient vehicle for the transformation of the economy. Those who favor elimination of the dual system underline the limits that dollarization imposes on monetary policy. With the quantity of dollars in circulation outside the government’s control, the capacity for the authorities to affect real variables through management of the money supply is notably reduced. Therefore, of course, the authorities’ ability to respond to negative shocks would be reduced. In the same sense, continued dollarization, it is feared, makes the Cuban economy ever more dependent on the monetary policy of the United States. A “looser” U.S. monetary policy might unleash a wave of inflation in Cuba, reducing purchasing power and setting off a wave of uncertainty which would affect investment and the risk premium (Sanguinetty, 1994). This side of the argument also mentions the sharpened inefficiencies in resource allocation, and the affront to national pride of not having an independent and strong currency. The foregoing arguments, which are valid in a theoretical sense, are not however well adapted to the specific conditions in Cuba. For example, the establishment of a single currency and a flexible exchange rate would endow the monetary authorities with a certain power to respond to adverse shocks. But, one must ask if in the short run, Cuba will be able to count on macroeconomic institutions that are capable of facing the difficult task of conducting monetary policy. No matter how competent the individuals who assume the task, they would have to operate in an uncertain environment, unknown and without any historical precedent with respect to the demand for money. Only with great difficulty could the authorities escape the political pressures from the most powerful interest groups, and even if they were able to accomplish this, the political and social cost would be high. While the possibility exists that the tools of economic policy might be used to benefit specific groups or individuals, society would live in constant anxiety. Without any doubt, dollarization would commit the Cuban economy to strong dependence on the monetary policy of the United States, but—as Sanguinetty (1994) has pointed out—it is very unlikely that the current monetary discipline of the United States would suddenly be relaxed. It is almost absurd to think that during a period of transition, Cuba would be more capable than the United States to lead the fight against inflation. If the costs of eliminating monetary dualism in Cuba are so high what, then, would be an adequate exchange rate regime during a transition? Our point of view is that at the beginning of the transition, the free circulation of the dollar should be allowed, while at the same time, the conditions for the establishment of a currency board are being put in place. A typical currency board has no active role in determining the monetary base. Fixing the exchange rate vis-a-vis the reserve currencies and a reserve ratio of 100 percent foreign reserves prevent a currency board from managing monetary base at it own discretion.9 Currency boards arise the skepticism of the defenders of discretional monetary policy, despite having been shown effective in assuring the stability of the nominal exchange rate and in controlling inflation, particularly in countries which have undertaken important economic transformations.10 Currency boards are not exempt from the difficulties inherent in fixed exchange rate regimes, but in the particular case of Cuba, it could be demonstrated that the disadvantages would be minimal. A fixed exchange rate regime carries the implicit danger of deflation and the concomitant recession, as well as limiting the capacity to respond to adverse shocks. With the aim of assuring exchange rate parity, the authorities could find themselves obliged to restrict the money supply, raising short-term interest rates and depressing economic activity. Therefore, one cannot discount the possibility that the authorities would succumb to the protests of certain sectors and decide to relax monetary discipline at the expense of sacrificing the exchange rate parity. Nevertheless, the probability that the exchange rate parity would become unsustainable depends on specific factors in each country, and specifically on the degree of vulnerability of the current account to random shocks. Cuba is a small country with an open economy and with a small productive plant, but it counts with great export potential in different sectors. The disappearance of the Soviet Bloc has brought with it the reorientation of the Cuban economy towards its international comparative advantages. The income generated by tourism shows a clear tendency to grow (Figure 2) and the export sector includes several categories of goods, ranging from the traditional (sugar, tobacco, rum) to products of biotechnology and genetic engineering (Figure 3). The resumption of normal commercial relations with the United States would carry great benefits for the export sector and the economy in general. The more open an economy the smaller the proportion of nontraded goods, which diminishes the probability of an appreciation of the real exchange rate, even if there should be large inflows of capital. The sudden fall in the output of most sectors of the Cuban economy implied shortages and hardships for the population, but in the end it meant a painful but necessary surgery. Several industrial plants, built with highly outdated, polluting, and energy-intensive Soviet or Eastern European equipment, have simply ceased to operate. The fleet of trucks, cars, and other means of transportation, also largely originating from the Soviet Bloc, has dwindled considerably, although it still has not been totally replaced. In a future transition, the authorities won’t have to confront (such as happened in Eastern Europe) the difficult dilemma of leaving thousands of workers unemployed or continuing production in inefficient and obsolete factories. Since the beginning of the 1990s, the consumption of rationed goods with controlled prices in Cuba has declined considerably, at the same time that consumption of goods at market prices has risen substantially. 11 State subsidies have dwindled to cover fewer categories of goods, while inflation eroded their value. All of this has transformed the attitude of average Cubans, who have had to procure their livelihoods on their own account. Some conclusions can be drawn from this. First, the fears that liberalization of prices in Cuba could be as painful as the experience in Eastern Europe (Fischer, Sahay and Vegh, 1996) are unfounded. Second, there would be the basis to fix an exchange rate at a level that reflects economic fundamentals to an acceptable degree. Finally, the flexibility in the allocation of resources diminishes the extent to which a restrictive monetary policy would cause unemployment. It is true that there continue to be controls and regulations on skilled work, which generates inefficiency in the allocation of resources. But, as it has been pointed out, these regulations and controls are not the result of monetary dualism. In the future, the regulations and controls on salaries that weigh down skilled work should be lifted, and the economy will have to suffer some inflationary pressure from this source. The above arguments suggest that the best option for Cuba in monetary policy would be a currency board. Under such a system, the issuance of money is completely tied to changes in reserves of assets, and absolute convertibility of the national currency, at a fixed parity, is guaranteed in advance. The currency board provides a simple monetary mechanism for those countries that do not have a developed financial system, or an experienced central bank. Another great advantage is that it would help to maintain fiscal discipline, since it prevents government deficits from being financed through the printing of money. Like any fixed exchange rate regime, the currency board requires an implementation that reflects a serious commitment on the part of the authorities. Otherwise, it can convert itself into a real boomerang. In the specific case of Cuba, it will be necessary to create certain conditions with the object of guaranteeing the credibility of a currency board. Of special importance is the creation of a new political and economic climate that reflects clearly the stage of true reform. Also required is the accumulation of assets necessary for the initiation of a currency board. At any rate, all of this would be much easier than the creation of a central bank capable of steadily guiding monetary policy. After more than four decades of socialism, it will not be easy for Cuba to gain back reputation and credibility in the eyes of the rest of the world: the doubt and uncertainty will not disappear from the Cuban economic scene just because the current leader leaves power. In this sense, a currency board, if correctly established, could make a noteworthy contribution to the stability of the country, as much in economic as in political terms. Monetary discipline would be a good guarantee of fiscal discipline and an insurance policy against inflation— phenomena that have damaged other economies of Latin America. Monetary dualism in Cuba presents very specific characteristics that distinguish it from other dual currency systems elsewhere in the world (where dollarization has been largely a spontaneous reaction to strong inflationary processes). As we have emphasized throughout, the Cuban State has been the promoter, and the defender of the dual circulation of currency. This is a reflection of the metamorphosis of a regime that has abandoned its paternalistic attitude in order to transform itself into a capitalist export monopolist. Dollarization has become a permanent feature of the Cuban economy, despite the lack of inflationary pressures and the stable exchange rate. For the moment, no significant changes in Cuban monetary policy are on the horizon, nor are they likely in the short-run. The persistence of the dual circulation of currencies in Cuba will inevitably condition the exchange rate policy in the future transition toward a market economy. Because the forcible prohibition against the dollar as a medium of exchange would carry with it too many problems, maintenance of dual circulation seems the most practical option during the transition. Also during this stage, the bases for a permanent exchange rate regime should be laid. The currency board stands out as an appropriate alternative, both in economic and political terms. 1. Following Calvo (1996), we will use the term currency substitution to refer to the use of a foreign currency as a means of exchange and the term dollarization to denote the use of foreign currency in any of its functions: unit of account, means of exchange and store of value. 2. It is currently posible in Cuba to buy legally a note issued by the government, popularly known as “chavito,” which is equivalent in value to the dollar, but can only be used as a mediun of exchange in the island. Although there are in Cuba no official series on the black market exchange rate, government officials such as Osvaldo Martínez, president of the Committee on Economic Affairs of the Cuban National Assembly, have recognized publically that it exists. 3. In this model, the real yield of the domestic currency is -π, which denotes inflation. Real yield of foreign currency is E*-π, so that the difference between the real yield of each currency is E*, the expected rate of depreciation of national currency. 4. It is important to note that in the Cuban black market there was an extensive trade in Cuban pesos for goods not produced in Cuba, but obtained — through misappropriation—from the non-dollarized economy. Examples: oil, tires, durable goods, repair parts for autos, most of which were produced in the Soviet Union. 5. At the end of 1993, the dollar was traded in the black market at 80 pesos. In mid-1994, the price of the dollar increased to 120 pesos. See Cabarrouy (1995). 6. The Cuban financial system is very simple. There are almost no commercial banks nor banks for development. The interest rate is an irrelevant variable in the Cuban economy, without any incidence in investment levels. The majority of investment projects are a matter of central decision and their financing is from foreign entreprises that have established joint ventures projects with the Cuban government. For additional information about foreign investment in Cuba, see Werlau (1997). 7. See Calvo and Vegh (1992) and Sahay and Vegh (1995). 8. Cuban citizens are allowed to have dollar deposits, but few people choose to do so because they do not trust the authorities to respect deposits and it is widely feared that the government will use the deposits to track people who obtain high incomes from legal or illegal acivities. 9. See Osband and Villanueva (1993). 10. Existing currency boards do not conform precisely to orthodoxy. See Hanke, Jonung and Schuler (1993). 11. During a recent trip to Cuba, one of the authors (Orro Fernández) observed that trade of products with controlled prices has almost disappeared. At the same time, trade of products with freely-determined prices has increased remarkably.